I went back to So Padre Island when the weather was at least better (warmer for me and some sun for photos) in hopes of better views. Thanks to Scarlet Colley, who has spent many hours hosting the birders who come to see it and making sure it does not get disturbed, the little owl is still being seen daily. 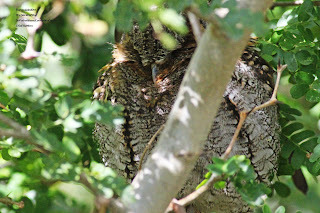 The Flammulated Owl has been roosting in different locations every day in the Warbler Rest Stop habitat at the So. Padre Island Convention Center. 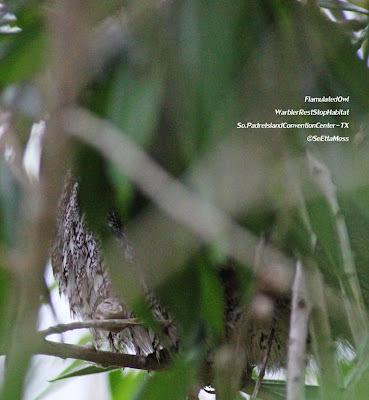 The owl was much more visible today though it still had branches in front of it's face most of the time--but that is necessary for the owl to reduce it's visibility to predators so you just need to consider it a challenge to get the best photos possible. 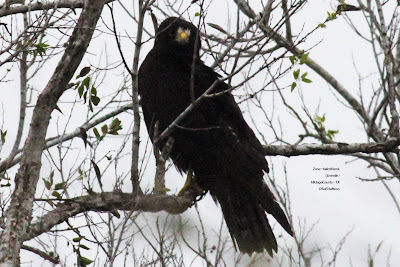 When I looked more closely with my spotting scope at this Zone-tailed Hawk at El Zacatel, I could see it was in juvenal plumage. The bottom pic shows the tail up close so the dark irregular bands on the dorsal (upper) surface are visible. 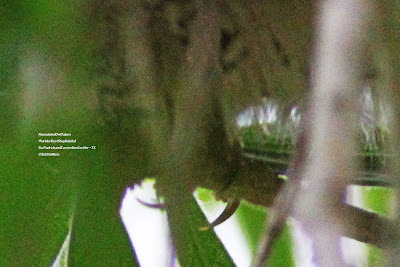 And on the far left of the tail feathers is one tail feather showing the ventral (lower) surface that whitish with dark black bands (only 2 visible). Note the 2 wingtips that are showing below the tail feathers, another feature of this species is their wings being very long. Also note the jaggedness of the tail feathers--I also saw this on the juvenile I followed as it perched and roosted at Frontera Audubon. 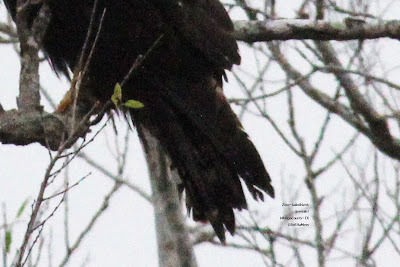 I suspect this is the same juvenile bird because this location is less than 10 miles from Frontera, well within range for foraging for such raptors, and the ragged tail feathers would be consistent. Two days ago I drove by El Zacatel where a series of resacas provide excellent habitat for a good diversity of waterbirds, waterfowl and other species especially when there has been enough rain to fill them. Though some are dry now due to the drought there is still enough water to draw a lot of birds. Shortly after I arrived I spotted a hawk perched in a deciduous tree that looked very familiar--when I checked it with my binoculars I saw it was a Zone-tailed Hawk. Interestingly this location is about 10 miles from Frontera Audubon Center where I found and followed 2 Zone-tailed Hawks. Though not a known location where they are found as was Anzalduas County Park but it is only a few miles from the Rio Grande River and Mexico. 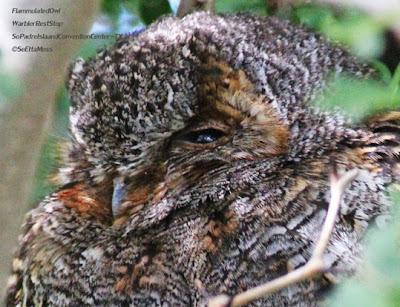 A rare Flammulated Owl was found by Larry and Vicki Kirby and Jim and Brenda Martin several days ago next to the Convention Center on So Padre Island. After not being seen a couple of days then seen yesterday afternoon then again this morning. I drove out there, arriving a little after 10:30 this morning and found a place to park my car only a few hundred yards away (there was this big market thing at Convention Center and hundreds of cars so some had to park a quarter mile away along the road outside the entrance). The wind was murderous, hard to stand in one area I had to walk through. Fortunately the owl had perched in a grove of trees in the Warbler Rest Stop habitat that was mostly sheltered from the winds so it was just cold and breezy (and gusty occasionally) while we watched. The owl was essentially embedded in a tree towards the back side away from the path so viewing consisted of seeing bits and pieces of the owl at one time and from one location.